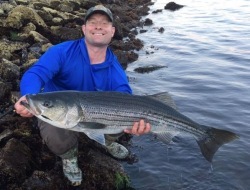 I am a member of Mass Striped Bass Association and I have attended a few meetings. They are a good group overall and I also surfcast so have found a ton of information at those meetings. That is a good idea to talk to them so I will make it a point of trying to get to the January meeting. At this point I have developed some strategic relationships that will be leveraged. 1. Weir River Watershed Alliance has an estuary center building which is on main road to Nantasket and on fishable stretches of river. So I have coordinated to use the estuary center for monthly meetings at a very low cost, which for 2019 I am paying the bill. As club gets more established may charge a fee to cover costs, but for now goal is just get something going and generate interest. Long term we are hoping to be able to provide some fishermen reports on activity seen with striped bass, river herring movement, and smelt movement as the alliance is looking to work on projects that will help restore the herring run and smelt runs to what they used to be. Also maybe get club members to participate in cleanup projects or stream/estuary enhancement projects that the Watershed Alliance is developing. 2. Trustees of Reservations have provided me with a way to get sanctioned group trip access to World's End for night striper fishing trips. That area will be base of operations for the club because its large enough that through walking it won't get too crowded and I don't really want to put undue pressure on some of the smaller public access areas that locals like myself have been fishing for years. Plus OTW spot burns Worlds End and Webb State Park incessantly in their weekly reports so its not like those two spots are not already very well know locations. I prefer Worlds End for club due to its proximity to the estuary center so fishing at night after a meeting is easy to set up. 3. Straits Pond Watershed Association is another possible partner. 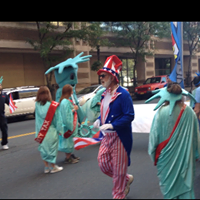 I am a member and I have been getting move involved this past year. There is an overall project they are working on to create good public use areas that could also be interesting spots for fishing trips once they are set up so I am trying to help with those endeavors. Also lot of opportunity for club members to help with cleanup projects and help them gather data on what is going on in the pond. 4. There is a local fly shop "Nantasket Fly Box" and I am in communication with the owner and he is excited to help the club out. 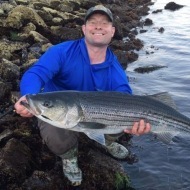 He is a great guy and already is helping through his business get more people into the sport and fishing for striped bass. I don't have a relationship other than being a customer but will be reaching out to Bears Den and another great local tier Mud Dog Flies about if they are ever interested in partnership for one or two meetings in a calendar year. Personally I will be providing a lot of the initial support out of pocket, but once things get moving I am sure club members will start chipping in for things. From a legal perspective its a bit easier to start if its all through one person it makes ownership of costs and how things get paid simpler, but I don't see it staying that way. I had no idea there was a fly shop near nantasket. I live pretty nearby, is it a shop worth driving by and checking out? Keep me posted. I fish with fly for trout and salmon. never done it with stripers but hey why not. Bit of a ride for me. Its not what you are envisioning. The only full service fly shops are Bearsden and Orvis. Chris runs the place part time and the majority of his fly sales are through the website. You can visit the shop in person on an appointment basis. Good Idea. 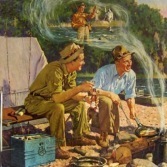 One thing I am hoping to do is being an Eagle Scout I would like to help local boy scout troups with Fishing and Fly Fishing Merit Badge. So I am looking into what I have to do to get certified to run those merit badges for Scouting. 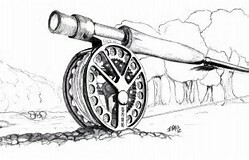 Ideally I would get some club members to help as additional instructors and bring some rods the scouts could use. Partnering with business within the industry is a double edged sword. Ie it cuts both ways. The Society I am a member of has steadfastly refused to take any form of sponsorship or advertising since its inception over 50 years ago. From time to time there are moves to change this but it has always been resisted by the majority. Being totally independent is priceless. Does independence mean high subscriptions. No ours is just $30 a year . Owners of an industry related businesses can be a member with same rights as any other member no more no less. Our quarterly magazine is advert free. Imagine that in this day and age. I’m in, I live in Weymouth and have been fly fishing the harbor for a long time. Fished and tied flies many time with Jack Gartside. Mike agree. There is no financial involvement. The only thing he plans to do is come help with gear for newbies. He rents fly fishing gear and will offer club members a discount on a rental from him. He also plans to become a club member as well. You can't recieve messages shoot me an email at daniel.clarke.wells@gmail.com I will add you to the distribution list about club meetings and events. You can't receive messages shoot me an email at daniel.clarke.wells@gmail.com I will add you to the distribution list about club meetings and events. The club may be base in Hull and you will get people from surrounding areas that are looking for something like you doing. I would also suggest that you contact the Bearsden in Taunton for two specific reasons, they already run a flying night night on Wednesday’s and during the season on Wednesday’s a met up night that is informal were they fish different locations. It is allots great way to meet locals to learn and make friends. The biggest thing to be is to generate interest in a club, the hard part is to maintain that interest, one way to do that is run a informal tournament during the season. We had group of guys who did this, it was done on an honor system iand limiited to shore only, to register it cost ten dollars and the money would go to a end of the year dinner with the remaining balance of the check split by those who attended. The tournament had a set start and finish date with the winner getting to hold a small trophy for each season. The winner would get the trophy to hold with their name and the dimensions. The winner was determined by a total number of length plus girth. Oh I see, thanks for the info. All great suggestions. Who is best person to reach out to at Bearsden? people get comfortable with night fishing is a special designation with a free hat or shirt with sticker. 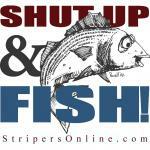 "Nightstawlker's Fly Fishing Association" which you officially enter catching your first 30" striper at night. Simple picture of fish on tape and honor system. Hull is certainly not the most convenient location from a driving perspective. Since I work 55-65 hours a week plus have a 2 & 4 year old I need to keep the clubs location convenient for me. My time is limited so Hingham, Weymouth, or Hull are close enough I can make this work. Since I am fronting the costs for metting location and doing all the upfront work keeping my travel time to a minimum is the only way to make starting this club work and still balance family and work responsibilities. I agree the extra distance to get to Hull may limit people attending. The meetings are at the weir river estuary center which is just accross bridge at start of Hull so as close to 3A as Hull gets. I wanted a location that you can fish from and hold meetings. This location allows for fishing without having to drive from meeting location. That way knowing the meeting is coming members can plan to get double value as they could show up early go fishing before meeting or fish after meeting is over. Its also very close to Worlds End which is where club night trips will go so it gives members another option 5 min drive from meeting site. I looked at places by Route 3 at exit 15 or exit 16 but ultimately decided being on the water by fishing was more important than being convenient to highway. 2019 will be entirely in Hull. 2020 if club is more established the location may change its certainly up for debate with whomever we have in membership next fall.